This accommodation is located right across the road from the beach - great for that early morning dip! And yes, you can actually watch Orcas cruising by when they come into and leave the harbour - an absolutely fabulous sight! Extensive decking and wonderful views. Absolutely the best views of the harbour, dunes, the heads and South Head right down to Omapere along the beach. 5 minutes to the Copthorne Hotel and centrally located between the boat ramps at Opononi and Omapere - you can park your boat on the lawn adjacent to the accommodation. BBQ and outdoor furniture provided. Travel cot and baby high chair available. Internet access is via Wireless - see the owners on site. PLEASE NOTE......if you bring your own linen the nightly rate is discounted by $10. The kitchen has just been refurbished and now includes a ceramic hob top, oven and dishwasher. New lino throughout the kitchen and bathroom. The physical address is: 185 State Highway 12, Omapere, Hokianga. HEAR THE WAVES CRASHING ON THE BEACH - AWESOME!!! Vacate by 11am. Check in time is 3pm. Pets ok outside on deck. please clean up the poo! If you plan on bringing your dog, please let us know when you request your booking- thanks! Full size bath with powerful shower over. Parking on the grass directly outside. Parking is sign posted. Avoid grass to the left in winter as it can be soft. Table on deck from which to enjoy the views and sunsets. Rawene GC is 22km away, 9 holes. Kaikohe GC 60km away, 18 holes. Accomodation was comfortable , clean & warm however when people moved into the unit next door they were very noisy in the morning. There doesn't appear to be any soundproofing between the units. Woken at 6.30 am Saturday & 7.30 am Sunday. Which isn't ideal when on holiday. The view is superb and sitting out on deck wine in hand, water lapping, watching sunsets is fantastic. 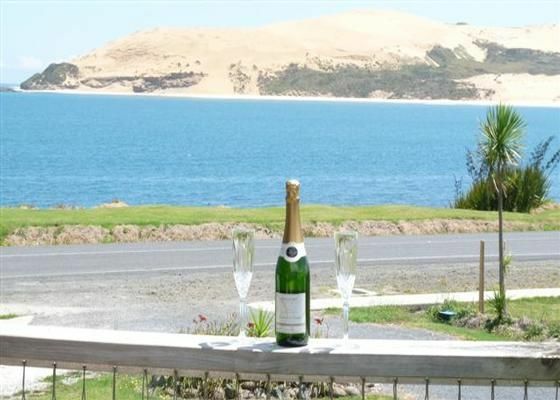 Gracious hosts made our stay even more enjoyable, we would not bother staying anywhere else in the Hokianga than Orca Beach Watch and fingers crossed you'll get to see the magical Orcas swimming past. Easy to find. Everything you need is there. Left feeling relaxed and rejuvenated.